The debt that the conservative movement owes Phyllis Schlafly is one that can never be repaid. It was Schlafly that wrote bestseller A Choice Not An Echo, the book used to promote the candidacy of Barry Goldwater, the man many argue paved the way for the Reagan revolution a little over two decades later. For years she also worked as an influential defense policy analyst and was responsible for the highly regarded study of Henry Kissinger's foreign policy, Kissinger on the Couch. Her legacy, however, will be her battle against feminism and the defeat of the Equal Rights Amendment. Although she's best known as the movement's most prominent foe, Schlafly nearly skipped the fight. Back in the early 1970s, a current events program needed someone to oppose a feminist in a debate. A friend persuaded Schlafly to take up the challenge and since then she's been the movement's most persistent intellectual opponent. That's readily seen in Feminist Fantasies, a collection of Schlafly's newspaper and magazine articles covering some of the most contentious issues raised in the debate over the feminist agenda. Divided into themed sections, Schlafly takes on all of the feminism's sacred cows, whether it's the role of women in the workforce, marriage and motherhood or the suitability of women in combat. It is Schlafly's contention, one she came to back in the early 1980s after her successful battle against the Equal Rights Amendment, that the feminist revolution is over. The movement began with the promise of equality only to give way to bitterness and an anti-male and anti-family agenda. Today's mainstream woman, she writes not without some foundation, refuses to use the feminist label and many are moving back into traditional roles. It's an interesting argument but it may be Schlafly's weakest one. She fails to consider that we, to paraphrase a famous declaration, are all feminists now. We have traveled so far down the road away from her view of what a woman's role in society is that we can never recover those halcyon days that she remembers. Women are having fewer children while those that do often wait until later in life -- essentially limiting the number that they can have -- and many of those children spend their days in the prison of daycare while their parents fight the good corporate fight. Where Schlafly's work is more convincing are her explorations into the role of the media in promoting feminism. 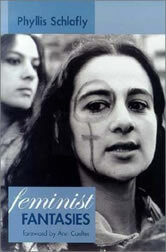 Without the willing assistance of the media, the feminist movement never would have been able to get out its core message that feminism was the path for the liberation -- primarily emotional, financial and sexual -- of women. As Schlafly relates, the other half of the coin sees the media fail to investigate feminism's negative aspects for women and families. From there Feminist Fantasies moves onto other controversial and interrelated subjects. Like a hammer on a nail, Schlafly repeatedly drives home the same point. Feminism is an artificial ideological construct that is at odds with reality and human nature. It denies the special status that is accorded women by society because of the unique gifts that they offer. It's an argument that resonates deeply for both women and men. Despite decades of attempted social engineering by feminists, it seems that some traditional structures refuse to die. Most women today want to be married, to have children and stay home to raise them. Economic and social changes in society may have robbed many of the opportunity to stay at home but it doesn't change the reality that many women suffer an emotional wound by being separated from their children. Worse still are the regrets of women, and this list includes the names of many prominent feminists, who bought into the belief that having children isn't necessary and due to their age will never have one. Whether or not you agree with Schlafly it's undeniable that she brings a passionate approach to her opposition to feminism. Feminist Fantasies is a convincing series of retorts to the accepted dogma of the feminist movement and a compelling defense of the values that most of us continue to hold. Whether the feminist movement is on the wane as many believe is something that only time can tell but if it is then its philosophical opponents can thank Schlafly.